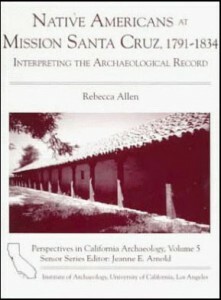 For over a century the missions of Alta California have been the topic of hundreds of books, articles, and "grey literature" reports, based on archaeological, documentary, and ethnohistorical sources. The views presented in the form of published books have either been highly polemic or descriptive, but rarely integrative. Within these parameters, it would be accurate to say that fewer than a dozen published books have integrated all three data categories in the interpretation of life on the California frontier. A welcome new addition in this research category is this volume by CMSA member Dr. Rebecca Allen. Allen asks, through the archaeological, documentary, and ethnohistorical record, if the missionization process, as epitomized at Mission Santa Cruz, resulted in acculturation (subordinated society is forced to change), assimilation (passive acceptance), or adaptation (active selection of new ideas). She posits that, in this case, the neophytes of Ohlone and Yokut descent did not acquiesce or passively accept "wholesale" the culture presented in the mission. Rather, they adapted and retained many of their precontact values and practices. To support this thesis Allen provides the reader with convincing evidence from both the archaeological and documentary records for cultural continuity and change. Because each mission had its own unique set of challenges, researchers are obliged to understand how idiosyncracies of individuals and local history influenced the character of the colonial experience. Chapter 2 presents an overview of California Mission history with specific attention to Santa Cruz. For example, here where the notorious Father Andres Quintana would minister, we learn that during the first eight years of its existence there was a turnover of six priests at the mission. Later, when the mission was evacuated in anticipation of a pirate attack it was looted, not by the marauders, but by the citizens of the nearby pueblo of Branciforte. These incidents suggest that the lifeways of both the newcomers and the indigenous peoples in this corner of the colonial world were troubled at best. In Chapter 3 Allen uses the ethnohistorical record to illuminate the lives of the Ohlone of the Santa Cruz region and the Yokuts of the San Joaquin Valley before their entry into the mission. This is one of the finest distillations of the technological, social, political, and ideological aspects of contact-era Ohlone life penned in the past decade. The reconstruction includes a detailed look at local fauna and flora and its contribution to Ohlone subsistence. The next chapter reviews archaeological work at this and other mission sites. She notes the paucity of published reports beyond the "grey literature". Importantly, it was noted that the archaeological record was mute when it came to separating Yokut from Ohlone. Chapter 5 investigates how the mission changed the physical environment. This includes the construction of permanent housing, the creation of fields and pastures and the introduction of exotic plants and animals. Allen notes the end of such precontact environmental controls as burning. She also notes the disappearance of the acorn as a primary food source and its replacement with Old and New World domesticates. It is in diet and work that Allen is best able to demonstrate cultural adaptation at the mission. Two behaviors are noted. The first is based on the introduced agricultural and animal husbandry practices of the Spanish colonial world. This includes the production and preparation of new foods. Even with the new foodways some traditional comestibles, such as fish and shellfish, continued to play an important role in neophyte diet. Perhaps most interesting were the changes in male and female procurement roles in the dietary regimen. While males tended livestock and worked in the fields, women were still involved in the collection of shellfish and some vegetal foods. Thus, we can see adaptation and modification rather than assimilation or acculturation. Material culture from the neophyte housing is examined in Chapter 7. In addition to descriptions of glass beads, an iron plow tip, and a rare religious medallion, the majority of artifacts were locally made using traditional technologies. These include shell and bone jewelry and a variety of lithic artifacts. The latter include projectile points made of chert, chalcedony, and porcelain and other hide- and wood working tools of chert, obsidian, and glass. In Chapter 8 Allen brings her archaeological, documentary, and ethnohistorical findings together in support of cultural modification. To summarize, the neophytes retain additional culture and only selectively added European They maintained a separate system of value from that of colonial newcomers. It was a value system based on prehistoric patterns, but with the incorporation of introduced material culture. Because they did not control the goods produced by their labor as part of the mission system, they were marginalized by the military and civilian populace. As a result ethnic differences between Yokuts and Ohlone faded and were replaced by a generalized neophyte "Indian" identity based on an indigenous value system. Well produced and profusely illustrated with drawings, photographs, and tables this is a volume that should be part of everyone's library on Califomia's mission past. Available for $25.00 from The Institute of Archaeology, UCLA, Box 95150, Los Angeles, CA 90095-1510. 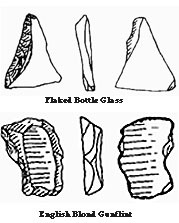 Flaked tools made of introduced material. 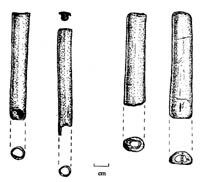 Bird bone whistles and bird tubes. 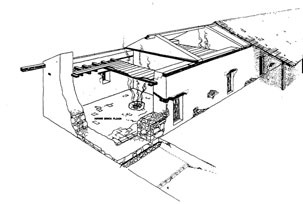 Cutaway perspective view of Mission Adobe. Drawing by David Felton.